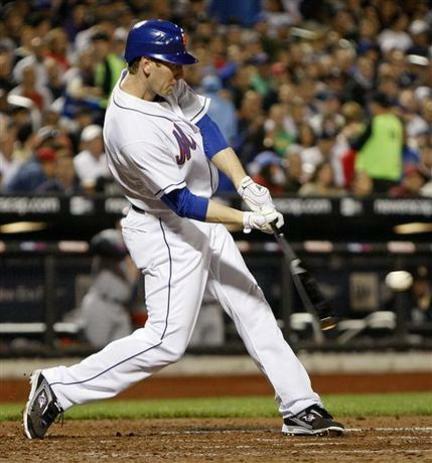 The Mets are 6-0 since Jason Bay was activated from the disabled list. Yet Bay, who is now hitting .391 after going 2-for-4 with a run scored Wednesday, is not exactly taking a bow. 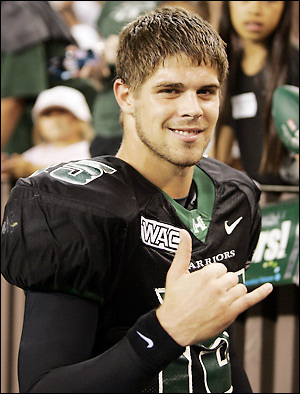 On April 18, 2011 The Honolulu Star-Advertiser announced that Colt Brennan’s father had released a statement that Brennan is expected to play for the Hartford Colonials in the United Football League in 2011. 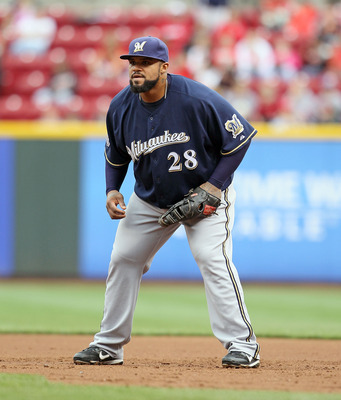 Here’s what we know about Milwaukee Brewers first baseman Prince Fielder: He’s one of the game’s premier hitters; he’s 26; he can be a free agent after the season; the Brewers are going to try to win it all with him this year, but if they’re out of the race by the end of July, they’re going to have to trade him because they know they don’t have the funds to re-sign him after the season. Indeed. Fielder went out to plenty of American League parks at that age, tagging along with his father, Cecil, one of the game’s best power hitters in the early 1990s. Not everyone knows this about Fielder: He’s a good athlete, above average defensively and a decent runner. 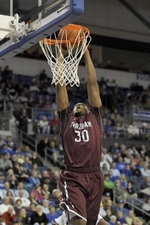 But, at 5-foot-11 and 275 pounds, he gets labeled as a slug, which isn’t the case. Cecil Fielder was a far better defensive first baseman than he was given credit for, had great hands and good feet, and could easily dunk a basketball despite his size: 6-3 and 230 pounds. Not everyone knows this about Fielder: He plays hard every play. He really cares. Not many. 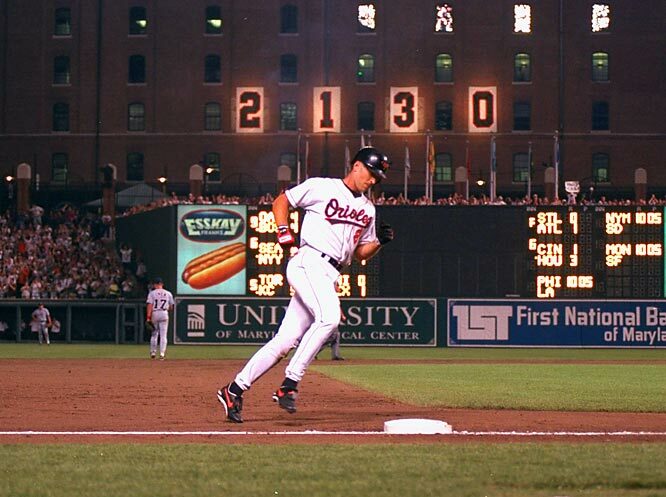 He has 195 home runs. Since the start of the 2007 season, only Ryan Howard has more home runs (174) than Fielder (165). 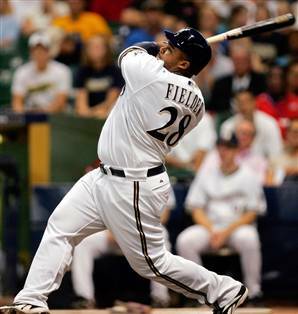 When Fielder hit 50 home runs in 2007, he became the youngest player (23 years, 139 days) to hit 50, breaking the record held by Willie Mays. When free agency comes around in November, Fielder will be in great demand by several teams (how would he look in a Cubs uniform?) but likely not the Brewers. Not because they don’t want him, but because they can’t afford him at what likely will be about $20 million a year. That price tag could go up with another huge year. Off to a great start, he leads the major leagues with 17 RBIs and is hitting .338. The demand for Fielder will be there not just because of his age — he is roughly 4½ years younger than Howard and another free agent-to-be, Albert Pujols — and not just for his track record, but for everything else he brings to a team. And what he brings to a team is a lot more than people realize. What are the average players in the NFL doing with their life? You might be thinking: I’m on the owners’ side in this lockout mess because NFL players are all spoiled, hat-backward millionaires who will no more miss a year’s salary than they’ll miss their eighth Lexus. 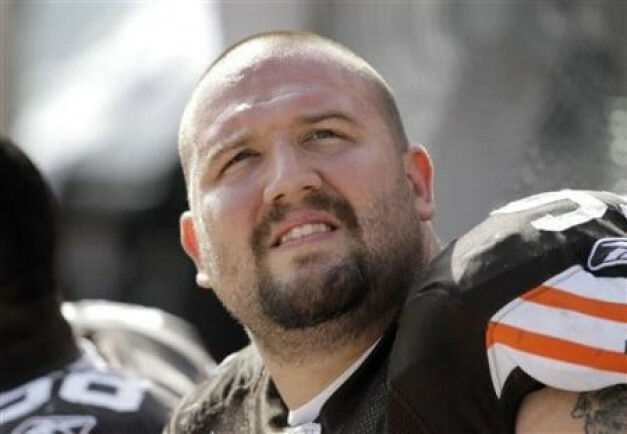 … Brian Schaefering, Cleveland Browns defensive lineman. He has a wife, three kids — all 8 and under — and a rented house. He doesn’t have a shoe deal or a Lloyd’s of London policy or a super agent willing to float him till this is over. Yeah, he’s got a safety net — himself. You hear anything about Dallas Cowboys owner Jerry Jones wanting to run a road paver lately? You might be thinking: What the hell has he done with his money he has made so far in the NFL? Well, he went undrafted in 2008, barely made the practice squad in ’09 and finally started nine games for the Browns last season, making $395,000. He says he netted just over $200,000 after taxes. And he had plenty of bills to pay going into last year. You might be thinking: What about these $60,000 checks that went out this week to the players from the NFLPA’s lockout war chest? That should pay for a few babysitters, right? 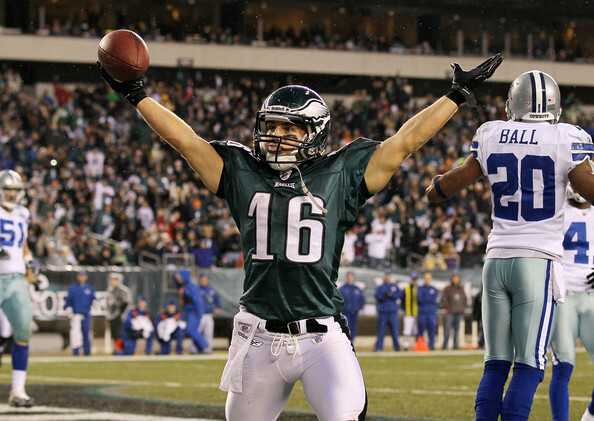 … former Air Force star Chad Hall, Philadelphia Eagles wide receiver. Hall, 24, isn’t getting any $60,000. Since transforming himself from an F-16 mechanic into a modern-day “Invincible” with the Eagles, 5-foot-8 Hall hasn’t exactly hit the Lotto. 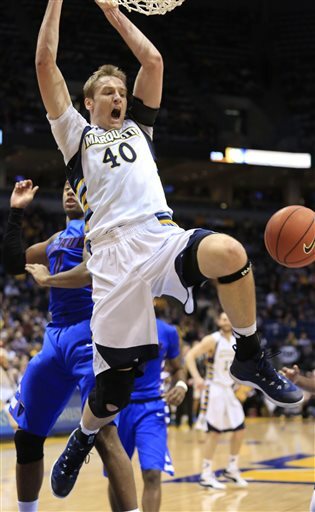 He was on the team for only 11 games, so he got the minimum salary, prorated. The most he’ll get from the lockout fund is “about $10,000,” he says. Now, he’s training friends’ kids for whatever they want to pay him — “I don’t really charge a set fee” — and trying to open a wings restaurant in Atlanta with his sister’s boyfriend, Detroit Lions QB Matthew Stafford. You think Seattle Seahawks owner Paul Allen will be asking “BBQ or teriyaki?” anytime soon? 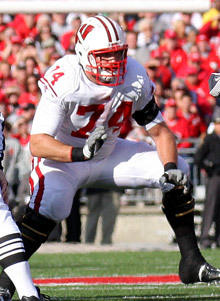 … University of Wisconsin All-American lineman John Moffitt. Moffitt is a projected early- to middle-round draft choice, a can’t-miss NFL starter who “will make plenty of Pro Bowls once he’s signed,” says his agent, Mike George. The problem is, what if he never gets signed? Moffitt’s got no job and no endorsement deals — “Nobody wants to see my face on anything,” he says — and “my parents stopped sending my allowance.” So George is paying for training and living expenses until something breaks. You hear anything about any NFL owners hitting up their dads lately? Plus, staying in top physical shape is a full-time job. “It’s not like they can do that and work at Macy’s at the same time,” George says. They might have to. Eagles lineman Winston Justice has opened a coffee shop. Teammate Owen Schmitt might student teach. Browns backup WR Rod Windsor is playing for the Arizona Rattlers of the Arena Football League, where some players are making as little as $400 per game. That barely covers the Advil. And then there’s this: ThePostGame.com recently reported that an estimated 180 NFL players might have signed for “lockout loans,” at rates that can climb over 30 percent upon default, to make ends meet. You might be thinking: So throw these guys a freaking telethon! I don’t care. Tell them to stop bitching. The rest of us have real jobs! I guess. But remember, the players aren’t the ones bitching. Among the four big pro sports in this country, these guys picked the one that pays the least money, lasts the fewest years and wrecks the most bodies. They’re fine with that. It’s the owners who have taken the football and gone home. It’s the owners who want a billion dollars back from the deal they have now. It’s the owners who want two more games from the players for nothing. And not a single owner is contemplating roofing at $12 an hour. So, if you’re still thinking you’re on the owners’ side in this? Then you’re not thinking at all. What if the Diamondbacks didn’t make this trade? Former Diamondbacks GM Josh Byrnes made many trades that dramatically altered the team’s future, but none more so than the 2007 deal to acquire Dan Haren. Hindsight is always 20/20, but what would the team look like if we undid this trade? 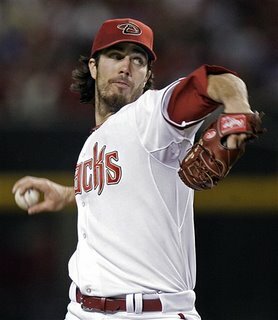 On December 14th, 2007, the Diamondbacks shipped Brett Anderson, Carlos Gonzalez, Chris Carter, Aaron Cunningham, Dana Eveland, and Greg Smith to the Athletics for Haren and Connor Robertson. At the time I called this a win for the Diamondbacks, failing to fully realize what Gonzalez and Anderson would become. So I can’t knock Byrnes for pulling the trigger, especially since he was adding a second ace to pair with Brandon Webb without hurting his big league club. Plus, Haren was signed at a third of his market value for three seasons. You have to give up a ton to get a guy like that. Still, let’s undo the Haren trade and put CarGo in left field for Arizona. We can also take Joe Saunders out of the rotation and slide Anderson in. Those are a couple of huge upgrades. WAR might peg the total upgrade over what the Diamondbacks have now at five wins or so, but I have to admit that intuitively it feels like the difference would be about twice that. Just undoing the one Haren deal, the D’Backs have a fantastic, affordable front three of Anderson, Kennedy, and Hudson in their rotation plus a pair of superstars at the outfield corners. What else would be different right now? Would Byrnes still have his job? Would Mark Reynolds still be manning third base? Would the team have made a more serious offseason push toward contending in 2011? It’s fun to wonder, unless you root for the Diamondbacks.